As we grow with our child, we grow up with them and along the way we make mistakes and learn from those. 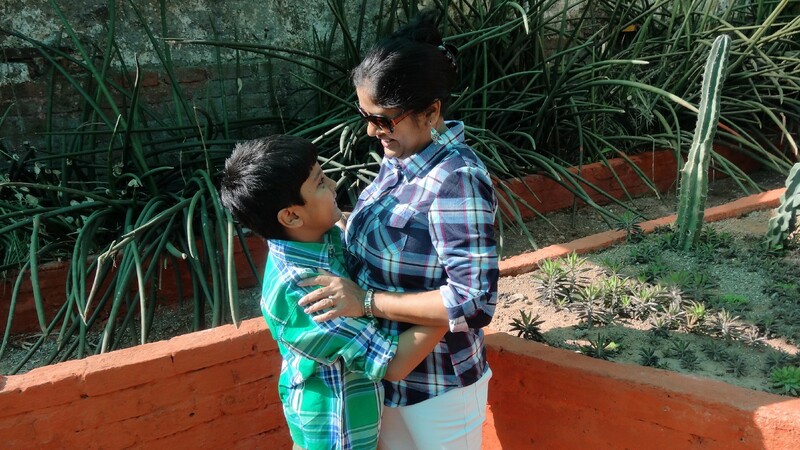 Tulika Prasad, Tulika is mom to Vedant who has Autism . She now runs a blog at www.braindroplets.com where she shares stories and experiences about her family’s journey. Before my son’s diagnosis of Autism, I had never even heard about the condition. No one in my family was familiar with it and I knew of nobody who had this diagnosis either. So I started with a blank slate, with absolutely no idea what to do, how to deal with its plethora of challenges , who to reach out to or where to start. I had no clue if what I was doing was right or wrong. Just as my successes were my own, so were my failures. We, as a family, learnt along the way as we experimented with different things. Over the years we’ve perfected a few things or so we think and there are some that we are still trying to figure out . For a few years after my son’s diagnosis, I would avoid discussing his condition to anyone- family or friends. Everytime someone asked about his delays, I would evade that discussion or just give a vague answer. It took me 3 years to come out and finally admit that my son has Autism. It took another few years for my husband and my family to accept this and not be ashamed about it. What caused this turnaround? It was the realization that talking about it is the best way to increase awareness and encourage acceptance. If I’m ashamed about discussing my son’s Autism, how can I expect others to accept him ? If I have a problem talking about it in the open, people will talk in hushed tones behind my back. I’m proud of my son, not inspite of his challenges but because of it. The moment I was not embarrassed about what my son was and what he did, others slowly started looking at him in a positive light too. As I educated people about Autism and the challenges that my son faces everyday, they began appreciating him more and avoiding him less. This, to me, was the first and the most significant step in our journey with Autism. With us embracing our son’s Autism, the journey became easier. I know that there will still be people out there who would not understand our journey but then not everyone is supposed to. The phrases “40 is the new 20”, “age is just a number” and “young at heart” sound so good but suddenly when it came to my son I was obsessed with making sure everything he did was age appropriate. I was not comfortable with the fact that he was 7 and still watching nursery rhymes so I kept pushing him to watch other stuff and try different things but he would invariably walk away and get lost in his world. We noticed that when he was watching his rhymes, he was happier and more aware of his surroundings. It was then that I realized that it’s more important that he connect with something than try being someone he is not ready for. The day I stopped trying to impose social standards on him and met him where he was, I found that we had more things to do and enjoy together. We were both happy when I accepted my child for what he is rather than what I want him to be. During the initial years of my son’s diagnosis, all my hubby and I did was research the internet for that magic potion that will fix him. There never was one. It probably was us who needed fixing our approach than him . Instead of enjoying his childhood and letting him be a kid that he was, we tried to pack his days with supplements, protocols, therapies ,exercises and more protocols. He hardly had time for himself. We hardly had time for him. We were busy ensuring that he was like every other kid out there . His uniqueness made us anxious. Eventually, as we came to terms with our reality and at peace with his diagnosis, we realized that our son was not a work-in-progress. He was our joy. It’s OK to try and encourage him to reach his maximum potential but it’s not ok to be obsessed about trying to make him someone he is not meant to be. We now have more time during the day for him. He loves going to waterparks and ride roller-coasters . He enjoys the wind on his face and rolling down a hill…and we would have never known that had we spent all our time turning our little boy into a project that needed a repair. Since my son could not talk, most of the time I assumed he did not know. One of the days while I was teaching him his alphabets and phonetics, I whimsically decided to go on beyond our usual A through E and I was pleasantly surprised to discover that he already knew much more than what I thought he did. There have been several instances after that that have proven that my smug notion of my son not being so smart was completely unfounded. I have come a long way from there now. I’ve noticed flashes of his brilliance in so many things that he does. I believe in his abilities much more and I know that his inability to express does not equate with his cognitive skills or intelligence. My son has learnt so much by just observing, listening and watching than I thought he was capable of. Everytime he proves me wrong , my heart swells with pride a little more! Autism is commonly characterized by behavior challenges and so it’s not unusual for parents to believe that everytime their autistic child has a meltdown, it has a behavior component to it. For a very long time I was that parent. More often than not when my son had a meltdown, I would insist that it was a behavior and that we need to ignore it. That’s exactly what I did. Ignore him. I believe this to be one of my biggest mistakes. When he needed me to understand him , I ignored him. I thought by not paying attention to his behavior I would be able to discourage and eventually eliminate it. Where I went wrong was in believing that all meltdowns are just bad behaviors. As I educated myself more I realized that I need to be more attentive to my son’s cues. Majority of the times there is a function to his behavior. It’s not to throw tantrums. It has a very specific reason for its occurrence. For instance, my son would have some phases during the year when his behaviors would increase. He would roll on the floor, and cry and bounce and be really irritable, grinding his teeth, banging his head and be all upset. I had no clue initially until we realized that his behavior peaked during allergy season. He was trying to tell us that his allergies made him extremely uncomfortable. He just didn’t have the words for it. Once we figured that out and took the necessary precautions, we saw a drastic fall in his meltdown. There are many similar examples where we were eventually able to identify the reason for his meltdown and that really helped us help him. I believe, it also helped build a level of trust between our son and us . It’s true that people on the Autism spectrum tend to float into a realm of their own every so often. However, to think that they are always in their own world is a huge mistake. I was at a party where all the kids were taking turn performing and singing while my son was in a quiet corner stimming on his favorite toy. After all the kids were done singing we thought of letting our son give it a shot too. He watches a lot of nursery rhymes but we’ve not really heard him sing those unless we prompt and sing most of it while he fills in a few words. As I handed him the microphone ,I did not expect much except some mumble. He floored me with not just singing (actually humming… but what matters is that he did it) the same rhyme that a little girl had sung just before him (which means he was listening to everything going on in the room) but also after the huge round of applause , he got up, walked upto his audience and sang 2 more rhymes. It shattered my belief that he is always oblivious of the world around him. What might look like his indifference not always what it actually is. He might not show it in the most obvious ways that he is observing and absorbing but he certainly is. I learnt never to underestimate him. He might sometimes wander off into his safe zone, just to take his sensory edge off but he is not always there. He is very much where he should be…learning and adapting…even though we might not feel it. I’ve used my son’s autism as an excuse for everything. I’ve, for a very long time, and sometimes even now done things for him that I know he can do if given a chance. One day I watched a motivational speaker , with none of his limbs, talk about how his parents never treated him any different from his other siblings. He talked about how that helped him become a stronger, more confident person who has achieved some of the most difficult feats like climbing the Everest. That was an eye-opener for me. I realized that I was not being an enabler, I was actually disabling him by being his crutch. I would change his clothes for him, feed him, open doors, pick up stuff and not let him try new things because I was scared that he might fail. Now that I’ve stopped sweeping all his skills or the absence of it under the Autism umbrella, he is blooming into a more independent kid. I can see the change in him. He explores more and he tries more often. I still help him but not until he has tried enough. We consciously try not to use his disability pass to cut the line when waiting for his turn for a ride. I know he has a hard time waiting but if I think he can, I would rather he learn to wait because life will not always give him a special pass. I’ve stopped making his life too easy because he has Autism and I’m glad I did that. When I got my son’s Autism diagnosis, I was in denial for a very long time. I had no idea how to react to this new situation. Over the years I’ve learnt to live in harmony and actually often enjoy everything that my son is. However, even now when I hear about a parent receiving the diagnosis, I’m not sure what to tell them. When I am still struggling with how to best support another parent in such a situation, why should I expect everyone else to be understanding and supportive all the time when they have not even walked a single step with me on this journey ? I would initially get upset over people not getting what I was going through but it finally dawned upon me that probably they were not supposed to. It’s not their journey. It’s mine. People can be clueless when thrown into a situation like this . A lot of the times they just don’t know what to make out of our situation or how to react to it most appropriately . I think it’s not unusual for someone to be ignorant about something they have not encountered . Expecting everyone to understand all the time is putting too much burden on them. What I can do is probably spread awareness . That I can do. I can help people understand autism better so that they can be more accepting…but presuming that what took me several years to accept and wrap my head around, the person in front of me should be able to do during the course of conversation is asking for too much. I’ll be glad if they do, I’ll work on it if they don’t. My mistakes taught me where I should have gone and where I went instead. They pushed me to try better and harder in trying to understand my son. My mistakes helped me get a clearer insight into my son’s situation and they helped change my perception of Autism for better. My journey is unique because my son is. It will probably take a lifetime to understand him and his challenges and I’ll probably make more mistakes along the way but what is important is that I learn and evolve so that I can be a better parent for my son. Originally published at www.braindroplets.com on April 25, 2017.